on academic support. Not on glossy colors for their 2011-12 report, quietly released on Friday. 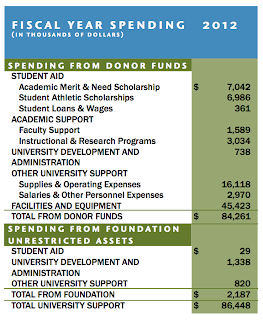 And the foundation’s own internal expenses have grown 20% in two years, from $5,463 in 2009-2010 to $6,646. 9/29/2012. 9/30/2012 Update: The Foundation has stopped putting the time-series data in the reports, presumably since it doesn’t look that great. I’ve added it at the bottom of this post, followed by Jamie Moffitt’s 2010 attempt to explain the weird “student athletic scholarship” numbers. 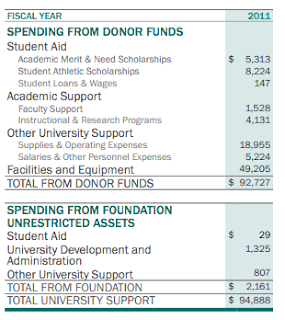 Essentially, the UO Foundation was laundering DAF donations, reporting they were being spent on “scholarships” when they really went to pay for things that would more accurately be described as team expenses. 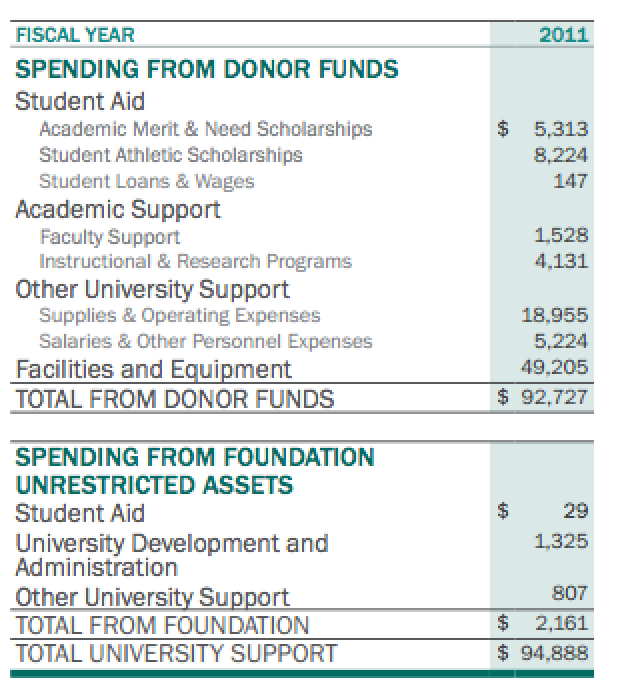 The foundation has a policy that donations must be related to UO’s core academic mission, but you know how that goes. To her credit, Moffitt seems to have put an end to that practice. after I raised these questions. But he thinks we should support an independent UO board? $300,00 per year CIO Jay Namyet did manage to beat the market this year, 2% versus 0.5%. Overall he’s below benchmarks for the past 3 and 5 years though. I doubt those calculations even include the $1 million or so it costs to run their investment shop, which can’t even beat the FTSE index. I’m no accounting professor, but if anyone wants to dig into these let me know what else you find. So why the snarky tone? I am not an accountant either, but a side by side comparison shows what I think you would point as a good thing. First, a decrease in athletic scholarships, an increase in academic merit and need scholarships and more student loans and wages. Bravo for improving the balance towards the academic side. Faculty support stable. 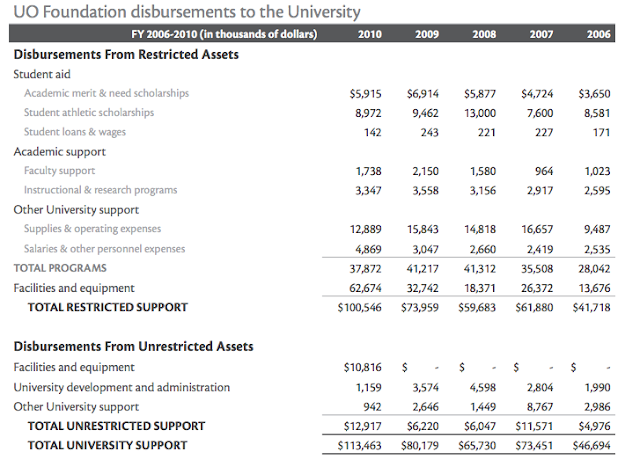 Deep cut in instructional and research programs, which could deserve a little more detail as to why and how those funds are allocated. But since faculty could potentially have options for research support from other grant sources, then the shift towards academic scholarships should be applauded. And moreover, this was done at the same time that major cuts were made in administration. Facility and operating costs have gone down — a surprise to me since I would have assumed that the new building would have increased them, but the Foundation moved from a rental property to an owned property. Salaries also went down — despite beating the market which would often trigger large bonuses if this was an investment shop on the street. All in all, I would say “good job”. The decline in payments for athletic scholarship is interesting. Obviously the cost of those has increased substantially, along with tuition and fees. 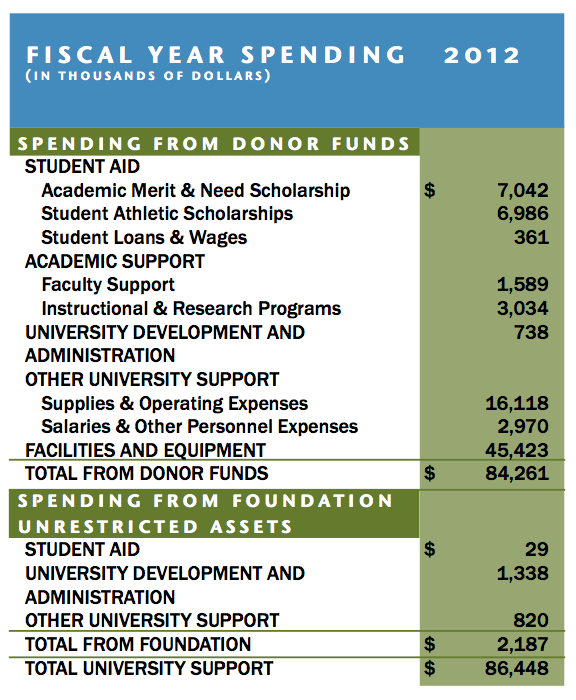 The UOF’s take from the DAF ticket donations is many times the cost of the scholarships, which in turn is 50% or so larger than the payment the foundation reports here. Presumably the difference is being buried in the “facilities and equipment” category, which conveniently lumps together athletic and academic facilities. Sneaky. I always wondered: I know that part of the presidents salary is paid by the foundation; however, presidents, emeritus status, and provosts usually hold “faculty” positions as well… And I suppose coaches may fall under this. So when they say Faculty support, could these be going to current and ex, presidents, provosts, lawyers, coaches who have some sort of ‘faculty’ appointment. 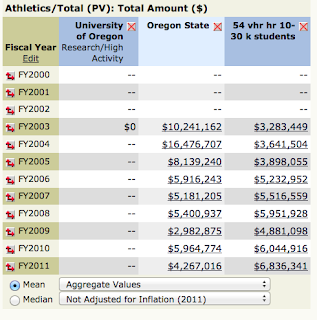 Finally, For some reason if you look at the history the Athletic support seems to be consistently higher than non-athletic, so I would question if this change of heart is just a single anomaly while the DAF, Phil, and the foundation are lobbying for their leveraged buyout of the UO (where the state pays the foundation to buy a cashflow positive, undervalued, massive cash and capitol on hand, ONE BILLION DOLLAR a year business). Honestly these numbers look like you would expect for any foundation that has been hit by the market collapse and recession induced decline in giving. But obviously something’s up with athletics. Don’t they have to report more specific expenditure figures to the IRS? Oh yeah, and Go Ducks! Athletics, again. Every time, it seems. They’re either doing the dirty work themselves, or our admins are doing it for them. Gottfredson… keep jamie (grant her the get-out-of-jail-free card, even though it is getting a little late for that), dump the others, turn this place around before you wake up to find that you’ve been doing their dirty work, too. Bean’s ego and bankroll is more important to Gottfredson than quickly demonstrating to the faculty that he understands how far off track UO has gone? I like the plan for performance evaluations. But Bean simply has to go, now. Before he spams us again, please!